Saturday night I took the Polarie Vixen out for its maiden voyage. It's a compact device that, when you mount your camera on it, helps your camera track the motion of the stars. For astrophotography purposes, this allows you to take much longer exposures of the night sky without the stars moving on you (since your camera is panning with them, obviously). And longer exposures means more stars and much better detail in them. If you're truly serious about astrophotography, your solution will be much more complex and expensive than the Polarie, but it will also no doubt be much less portable since the Polarie is about the size of a small 200-page novel. The hardest part I found to be was actually getting the Polarie aligned properly. When we talk about "aligning", what we're doing is trying to get the rotational axis of the Polarie to be parallel to the axis of the earth so that it rotates at the same rate and along the same line as the sky. To do that, the Polarie has to be aligned with Polaris (i.e. the North Star), which is the closest bright star to the end of that axis. 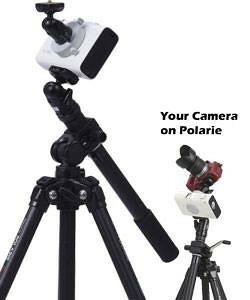 I bought the Polarie Polar Scope which is supposed to make it easy, but for some reason I found it not to be. That being said, I can see it being the easiest and most accurate method when trying to get a solid alignment, but since I didn't practice beforehand or really read any instructions... You get what you put into it. Anyways, I thought I had a grasp on things, but also knew that this would be just a test night to see if I could do anything worthwhile with this setup. 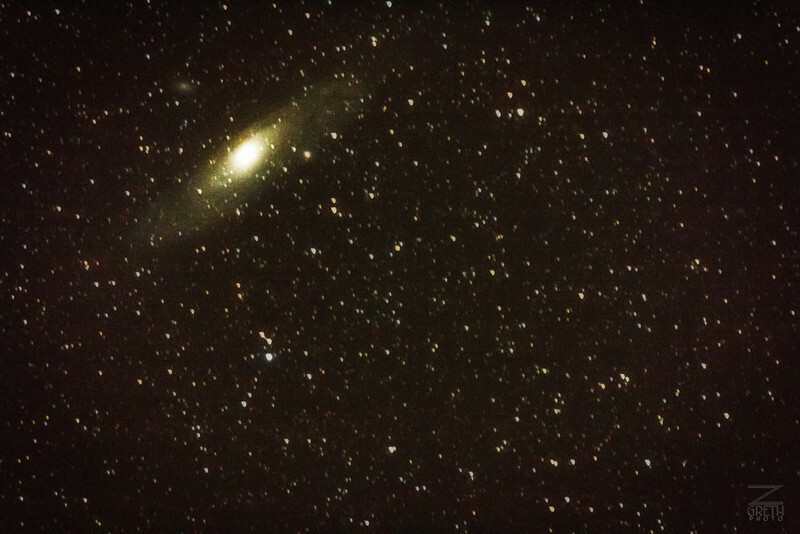 So while my main camera was clicking away on some other night sky vistas, I took my old Canon T2i and its kit telephoto zoom (250mm) and mounted it on the Polarie, which was in turn mounted on my backup tripod (I was also concerned about how much weight the Polarie could handle, and this was the lightest setup I could think of). Trying to do this in 15-20 mile wind gusts also caused quite a bit of headaches. After unsuccessfully trying to get it aligned for a half hour, I folded up the tripod legs and put it on the hood of the car shielded from the wind. That seemed to work, although I still struggled with finding the perfect alignment (the ballhead on my backup tripod isn't made for finely tuned adjustments) and good focus. I think the focus ended up being my downfall, so I'll have to research some better methods in the future... or hope that it was really just the cheap lens and its focus ring that was the culprit. After "alignment," I set off trying to find the Andromeda Galaxy in the sky since I've always been fascinated by its beauty. Maybe it's because Apple had it as their default desktop background for a number of years. I used one of my phone apps (Star Chart for Android) to help me pinpoint it, although I already had a decent idea as to where to look. 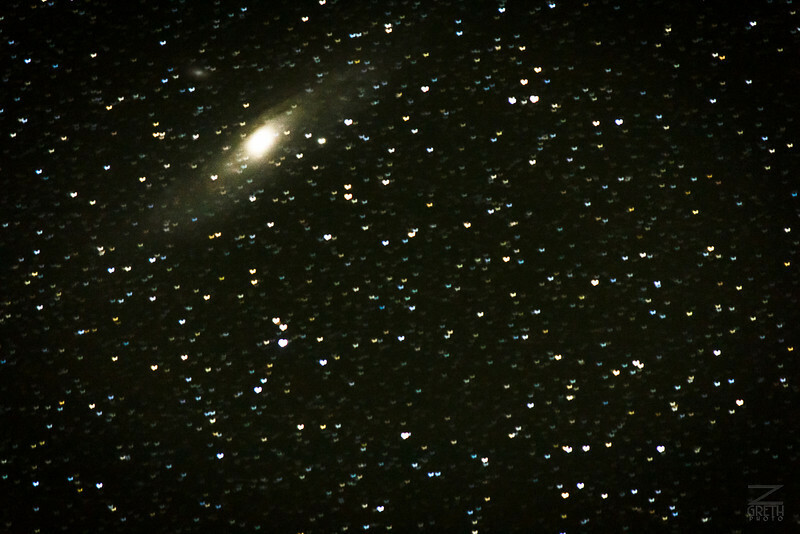 Starting zoomed out at 55mm, I was able to get enough of the sky for a test shot to reveal Andromeda and help me get it more or less centered in the frame. So I zoomed in and then took about a dozen test shots with some very, very minor adjustments until it was close enough for my liking. At this point I still wasn't sure how to do proper astrophotography, but I remembered some things I had read about light frames and dark frames. In short, cameras tend to produce a lot of noise in the image when you take long exposures. That's just the nature of the electronics warming up and causing problems. So if you take a whole bunch of the same image at the same settings, there is some software (like DeepSkyStacker) that can basically layer each of them and pull out the bright spots (the stars) to get a whole lot more detail that you can see (although it's much more complex than that explanation). These are the light frames. Then you can also take dark frames, which are the same thing as the light frames only with the lens cap on. These are all averaged and then subtracted from the light frames in the software, effectively removing a lot of the random noise. There are also a bunch of other things that you can do to get even more detail, but I haven't figured that out yet. I took a couple of shots at ISO 6400 and 30 seconds to test the alignment and everything, and then set up the intervalometer to start firing off 2 minute exposures at ISO 1600 since my T2i is horrible at ISO 6400. After about 20 frames, I put the lens cap on, hopped in the car, and drove off to find another location deciding to play around with these images first before trying again on another subject. I figured the camera would happily snap away for a while, but unfortunately after about 6 dark frames, the battery died. Oh well. The next morning I got home and downloaded the images to my computer and started to look at them. Sadly, I finally saw how out of focus they all were. And the 2 minute exposures were even worse because of the alignment being off. The first image is the best I could do running the best ISO 6400 image through Lightroom and ColorEfex4. The second image is just to show you the effects of out of alignment on a 2 minute exposure. 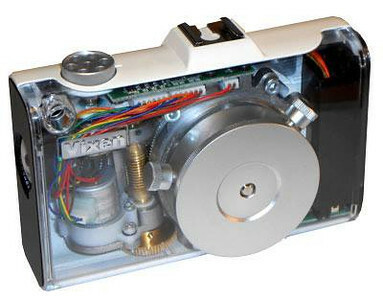 The third and fourth images are courtesy of the Polarie Optics website to show you what the Polarie Vixen looks like. So what did I take away from this exercise? The Polarie has a lot of excellent potential, in the hands of a more seasoned astrophotographer. I'll continue to tinker with it and practice alignment. I'll also probably take my laptop into the field next time so I can check the focus on a bigger screen than the back of the camera. And I'll also swap out tripods, cameras, and lenses to see what effects those produce. But given that at 250mm, the longest exposure you can do without the stars moving on you (Rule of 600!) is 2-2.5 seconds, I'd say that the Polarie more than held its own over the course of 30 seconds and even 2 minutes. We'll see what it can produce if I ever figure out how to get it aligned properly.